Colonists are the living inhabitants of each RimWorld colony. 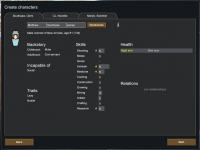 Each colonist has specific skills, positive and negative traits, and a character backstory. In general, every human is a colonist except for raiders/travelers/prisoners. The colonists come in various outfits based on their background, which can be seen by looking at the 'Character' tab in game. Upon creating a new colony, a screen where 3 colonists can be randomized individually is shown. The player cannot pick each character aspect by its own. Each of the colonists has a name, an age, a backstory, limitations, traits, and skills. The name is the only information that does not alter a colonist. The age can cause Cataracts, a bad back, Frailty, or other age-related conditions. Traits can cause mood disruption, psychic resistance, increase in skills, and so on. Each colonist has different skill levels generated at the start. They tend to range from zero to five, before accounting traits and backstories. Those numeric values are not fixed but temporarily and will increase as the character performs actions related to that area. Older colonists tend to have better skills, but these are often offset by their poor health. Each colonist will have one or two backstories, teenage character will usually only have one due to their young age. Each story has a short description to go along with it, detailing a portion of the colonist's past. Each backstory has different effects on the colonist, such as increasing/decreasing stats and disallowing certain tasks. Such information is important to consider when creating the first colonists for the new colony. It may be difficult to even survive the start without certain skills, and future colonists may not join for awhile. There are 4 default scenarios, in addition to the ability to create/ download more. Each can have different attributes, e.g. no. of colonists, starting equipment, etc. Colonists may be dropped in escape pods on the map or start off standing. Upon generation of a new colony, starting characters will have varying equipment. For example, colonies starting as New Arrivals will be outfitted with synthread clothing, while New Tribes will be outfitted with tribalwear. In addition to being clothed, equipment, supplies and materials will be dropped with or near the starting point, or scattered around the map, depending on the scenario. Over the course of the game, other colonists can join, by walking onto the map from the border, falling in from their own pods via an event, be discovered in cryptosleep sarcophagi, captured and recruited or bought from slave traders. Colonists can be equipped with various items, which are shown on their information panel while individually selected. They can only be equipped with one item type at a time, meaning a single shirt, a single weapon, and so on. Their skill with their weapons is determined by their skill with Shooting, for projectile-based weapons, and Melee for the rest. An example of this can be seen below. The work tab allows manually setting the tasks that each colonist is allowed to perform. Colonists will have a natural aptitude at a task, and have no check-boxes for tasks they are unable to perform. You can also prioritize a colonist's actions manually. To do this, go to the Work tab, and check the Manual Priorities box in the upper left-hand corner. The colonist has the numbers 1-4 in each check-box available, with 1 being the highest priority. If two or more tasks have the same prioritization number, then the colonist will do tasks from left to right, in relation to the task menu. The Thoughts tab shows what your colonist is thinking and experiencing, whether good or bad, and these thoughts will increase or decrease mood. Colonists, and all human characters, have basic needs that, if not met or if met beyond expectations, may trigger Thoughts to appear below the Mood meter. The current Mood is a net result of these thoughts. Food - the need for food. Rest - the need for sleep. Recreation - the need for enjoyable activities. Beauty - the need for a desirable place to live. Most colonists don't like environments covered in dirt, blood, or debris, and prefer to be in lavish rooms furnished with beautiful statues, large wooden royal beds, and plush carpeted flooring. Comfort - the need for comfortable places to sleep, eat and relax. Besides basic needs, any drug addictions a pawn has are also listed as a need. This page was last edited on 21 February 2019, at 22:49.